Got a chance to use a $5 off $15 coupon I'd gotten from Big Lots. I really like their washcloths, they're bright and colorful, and look sturdy. It also works out well in that they are $5 for 9, so I can just run into the store and pick up 3 packs and use the coupons, so 27 for $10 or 37 cents a piece. Not the cheapest price, but good for the quality!! My sister and mother have been busy sewing pencil and tote bags! We will be crafting for our Operation Christmas Child shoeboxes throughout the month of January 2019 using our scraps of fabric. As my mom shows in the video below, the two main items we will be making are pencil pouches and book bags. It is our goal to include one of each in every shoebox we pack along with school supplies. We also want to make extras to have ready to donate if our church youth group or children's ministry do a packing party this year -- if not, we will save them for next year. You can find tutorials for both here on our Crafting for Operation Christmas Child Shoeboxes page along with several other tutorials. Chelle, from Chelle's CayBees, and Suzanne, from Sew Delightful, will be partnering with us. 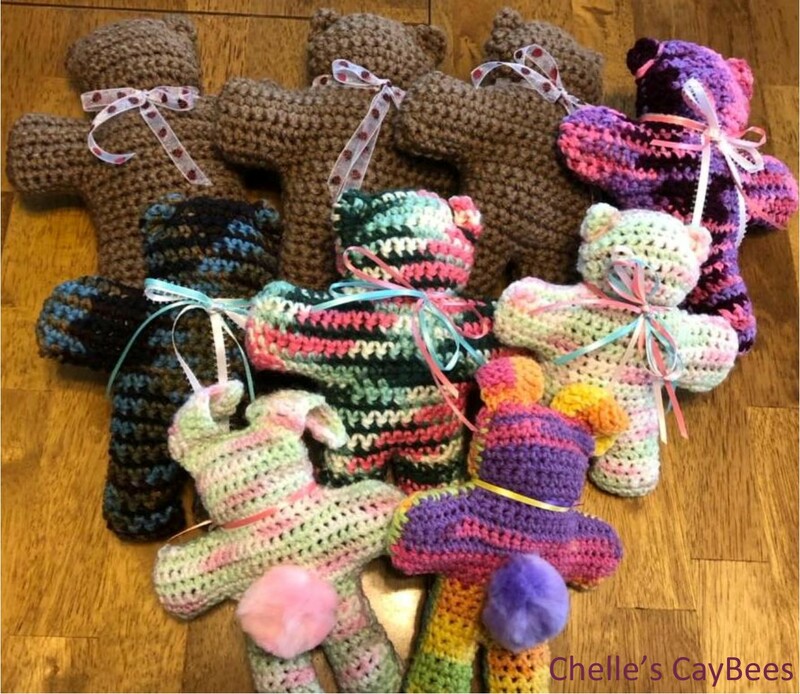 Chelle will be crafting from her yarn stash for OCC and for Preemies of the Carolinas. Suzanne will be crafting with fabric creating both sewn and no-sew projects. 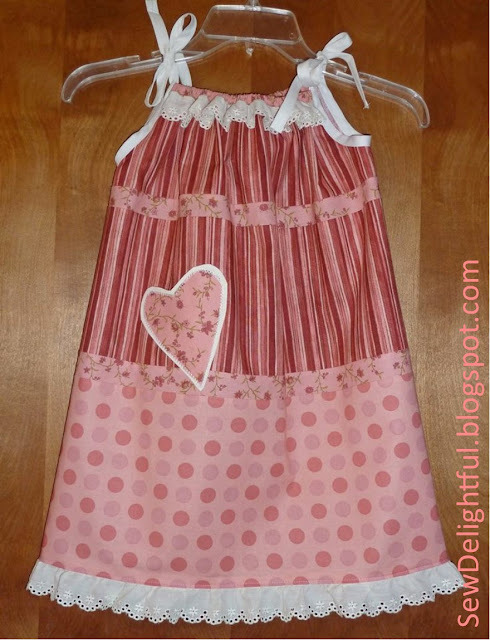 A pillowcase dress sewn by Suzanne. We want to invite all of you crafters to join us! You can follow along on our Facebook pages to see our progress and what others are crafting and share your own completed items or work in progress. Crocheted bears and bunnies by Chelle. 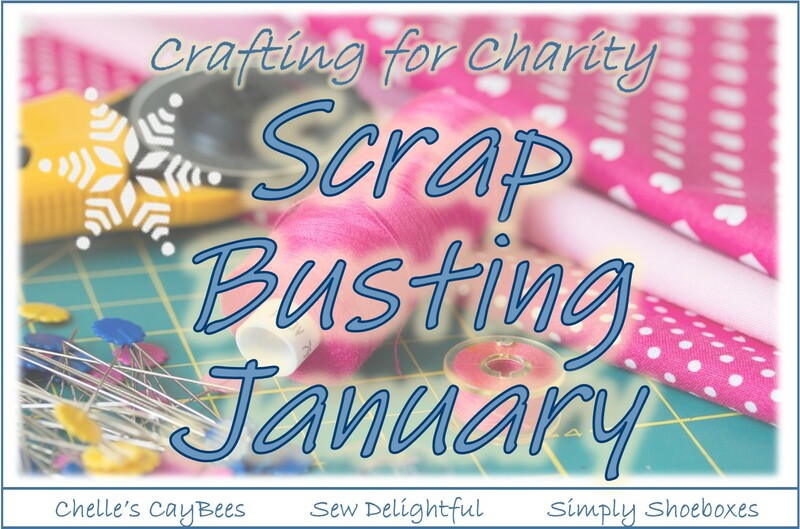 We will be crafting throughout the whole month of January so you can join us for a day, a week, or the whole month at your convenience! What will you be crafting for Operation Christmas Child? We got a good amount of supplies for our shoebox packing supplies this week, but didn't spend much due to donations, clearance, and crafting! Some friends picked us up some cars at Big Lots for us-Hot Wheels and pull back cars. Got more of the Cow Bells on clearance at US Toy-$3.95 for a dozen here's the link for the orange ones, you can search for the other colors...really happy with them as musical toy!! My sister had to buy a couple gifts which came to $10, so used my $5 off $15 coupon to pick up washcloths for free. Plus at a party $5 gift exchange she got a scarf she plans to pack in a shoebox. Finally some great items crafted by my mother and sister: pencil bags, tote bag, and Aunt Ida Hats. So, it's never too early to get started on next year's shoebox prep! :) So, even while we're cleaning up and cataloging from this year's packing party we've been getting ready for next year's. I stopped by a charity thrift store. Now we can't send used items, but I found two games new in package, 2 unused coloring books, 4 model dinosaurs that don't look used at all, and an educational toy that's packaging is messed up, but insides look new (so I'll just re-package which I often do, anyways). Stopped by Harbor Freight and used some coupons to pick up some screw drivers to put in the 10-14 boy boxes for next year, we have a few of the sets of screws left that we put together last year that we can put with these. My mom and sister have been busy crafting for our shoeboxes: pencil bags, tote bag, lovie blankets, and Aunt Ida Hats.